Eat Your City: Taste of Summer fruit smoothies - pineapple and mango! Taste of Summer fruit smoothies - pineapple and mango! Posted by I refuse to acknowledge the days are getting shorter and cooler. 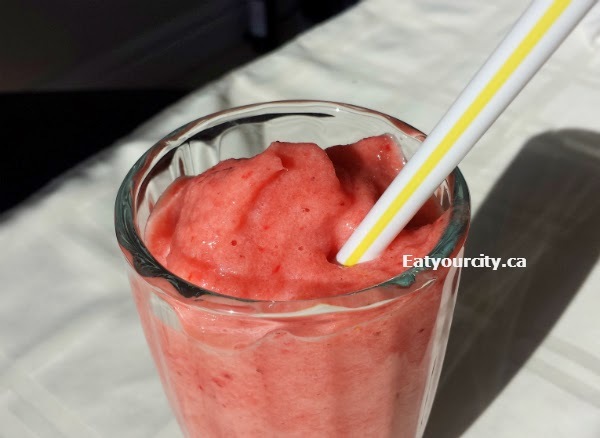 And to continue my weather obstinacy, here's a bright smoothie recipe with thanks to the global market, we can have a taste of summer fruits year round! I've used pineapple and mango combo here, but I'll cover a bunch more fruit-fruit, fruit-vegetable combos in a bit. I'm not a huge fan of putting honey or sugar into my smoothies, but since I do have a sweet tooth, I rely on using sweeter frozen fruits and I toss the liquid from canned packed in water only in to boot. Always load up your blender with the liquid on the bottom and the frozen items on top... when I tried the opposite way round, it super challenged my mixer and I had to add in a bit of water to get things from moving beyond a block of frozeness to a nice smoothie texture. Add liquids first, then use frozen fruits/veges to thicken. Always put liquids on BOTTOM first! !